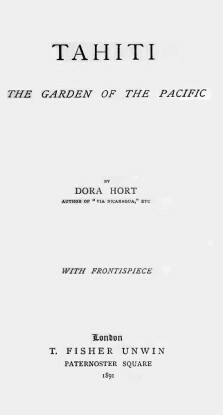 Tahiti, the garden of the Pacific / Dora Hort. - London : T. Fisher Unwin, 1891. - 352 p. ; 23 cm. Pour le père Patrick O'Reilly, Mrs Hort serait « l'épouse du Hort payant patente de négociant et de marchand à Tahiti dans les années 1860 » 1. Il est vrai que l'auteur semble prendre plaisir à brouiller les pistes : l'héroïne-narratrice de son récit évoque son mari « comme un personnage étranger qu'elle nomme A ». Comme le sous-entend le père O'Reilly, Mrs Hort en dit plus sur les intrigues de la société coloniale à Papeete que sur l'île et ses habitants. Restent l'exotisme du décor — et un regard sans complaisance sur l'administration coloniale français. EXTRAIT Paradise itself could scarcely boast of more transcendent charms than exist on the island of Tahiti ; charms which are dimmed by the acts of a corrupt administration that fails to study the prosperity of the country, preferring to pursue an illegal course to its detriment. Every description of baneful influence at present exists on the island, and will continue to exist so long as Governors of the De la Ronciere stamp are sent to Tahiti. I fail to comprehend what object the French Home Government have in increasing their colonies when they so culpably neglect those already in their possession. The French Protectorate of Tahiti dates from the same period that the British flag was hoisted at New Zealand, yet up to the present moment neither a bank nor even an exchange office exists in the colony, and Le Messager de Tahiti in its original form, continues to be the only newspaper in circulation. That no one has been enterprising enough to introduce a more improved order of things is explained by the fact, that at Tahiti foreign innovations do not meet with the proper kind of encouragement. M. de Juslard succeeded M. de la Ronciere, but he was scarcely the man to cope with the situation, neither did he feel disposed to interfere in the past policy of the Government, or to weed the administration of its unworthy members, as he had merely accepted the position pro tem. That onerous duty was to devolve on his successor. The frigate Astrée, commanded by Admiral Cloué, arrived at Tahiti for the purpose of investigating the conduct of the late Governor, which he entirely condemned ; but what sort of redress was that to those who had sustained immense pecuniary losses, or had been subjected to harsh treatment and cruel injustice, as in the case of the Ordonnateur ? When we bade a final adieu to the Garden of the Pacific, there seemed a prospect of its resuming the normal state of comparative fredom from that detrimental tracasserie which is the acme of French colonial policy.